We summarize original research in the field of critical care nephrology that was accepted for publication or published in 2007 in Critical Care and, when considered relevant or directly linked to this research, in other journals. Four main topics were identified for a brief overview. The first of these was the definition of acute kidney injury and recent evidence showing the validity of RIFLE (Risk, Injury, Failure, Loss and End-stage kidney disease) criteria and the recent Acute Kidney Injury Network review of the same criteria. Second, we cover the clinical and experimental utilization of novel biomarkers for diagnosis of acute kidney injury, giving special attention to neutrophil gelatinase-associated lipocalin protein. The third area selected for review is outcomes of acute kidney injury during the past 10 years, described by a recent Austrailian epidemiological study. Finally, specific technical features of renal replacement therapies were examined in 2007, specifically regarding anticoagulation and vascular access. Original research in the field of critical care nephrology has produced in 2007 interesting results on different aspects of acute kidney injury (AKI), that are expected to provide relevant information in the next years. The definition of AKI and the validation of severity of disease criteria have been exstensively evaluated and revised. The research on clinical and experimental utilization of novel biomarkers for the diagnosis of AKI and especially of neutrophil gelatinase-associated lipocalin protein is promising early diagnosis of kidney injury. The outcome of acute kidney injury in the last 10 years has not significantly changed, but this finding must be evaluated with great attention. New approaches to manage circuit patency and extracorporporeal circuits blood flow rate have been scarcely studied in the last years and new experimental and clinical trials are welcome. Reminiscent of the acute lung injury/acute respiratory distress syndrome consensus criteria , the epidemiology of AKI, as defined by RIFLE criteria (Risk, Injury, Failure, Loss and End-stage kidney disease), is becoming clearer. It now appears that kidney dysfunction is often under-recognized, although its severity is clearly associated with outcome. AKI is now considered the correct nomenclature for the clinical disorder formerly termed 'acute renal failure' (ARF). This new taxonomy underscores the fact that AKI exists along a continuum, recognizing that the greater the severity of injury, the more likely it is that the overall outcome will be unfavourable. AKI is not acute tubular necrosis and it is not ARF. Rather, it includes both as well as other, less severe conditions that are not necessarily 'structural damage' but also include 'dysfunction' (slight, apparently innocuous increases in serum creatinine; decreases in urine output due to volume depletion, generally defining prerenal ARF, with the implied and flawed meaning of a benign and reversible form of renal dysfunction). Instead of focusing exclusively on patients with severe and established renal failure, those who are receiving dialysis and those who have a specific clinical syndrome, the robust association of all AKI classes with hospital mortality behoves us to raise the profile of this disorder as a matter of urgency . We recently reviewed 13 studies in which patient-level data on mortality were available for Risk, Injury and Failure patients (RIFLE classification), as well as those without AKI (non-AKI patients) . Our objective was to calculate a pooled estimate of risk ratio for mortality in patients of Risk, Injury, or Failure classes as compared with non-AKI patients. More than 71,000 patients were included in the analysis of published reports. Relative to non-AKI patients, there appeared to be a step-wise increase in risk ratio for death going from Risk class (risk ratio = 2.40) to Injury class (risk ratio = 4,15) and then to Failure class (risk ratio = 6.37; P < 0.0001 for all comparisons; Figure 1). Risk for death among patients with AKI. The data were obtained in a recent review of 13 studies that used RIFLE criteria where patient level data on mortality were available for Risk, Injury and Failure patients, as well as those without AKI . The review was conducted to establish a pooled estimate of risk ratio (RR) for mortality for patients of Risk, Injury or Failure classes compared with non-AKI patients. More than 71,000 patients were included in the analysis of published reports. 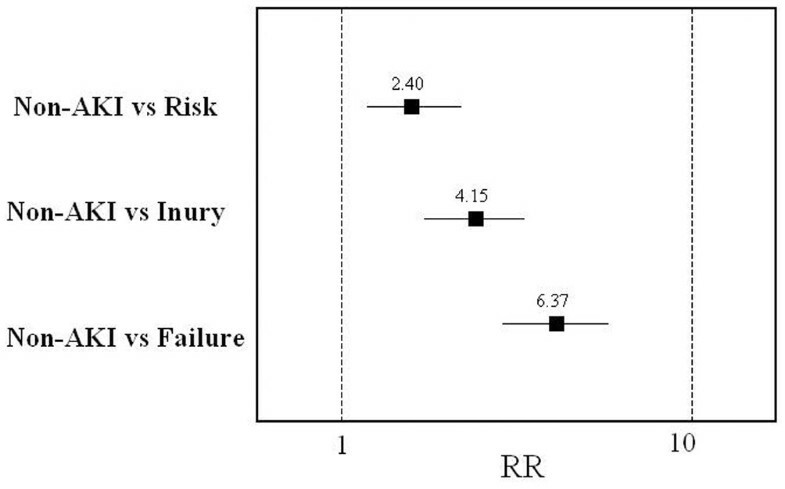 With respect to non-AKI patients, there appeared to be a step-wise increase in RR for death going from Risk class (RR = 2.40) to Injury class (RR = 4.15) and to Failure class (RR = 6.37; P < 0.0001 for all). AKI, acute kidney injury; RIFLE, Risk, Injury, Failure, Loss and End-stage kidney disease. The Acute Kidney Injury Network (AKIN), formed by members representing key societies in critical care and nephrology along with additional experts in adult and paediatric AKI, participated in a 2-day conference in Amsterdam, The Netherlands, in September 2005 in order to review the RIFLE criteria [4, 5]. AKIN redefined AKI as 'An abrupt (within 48 hours) reduction in kidney function currently defined as an absolute increase in serum creatinine of more than or equal to 0.3 mg/dl, a percentage increase in serum creatinine of more than or equal to 50% (1.5-fold from baseline), or a reduction in urine output (documented oliguria of less than 0.5 ml/kg per hour for more than six hours).' Several specifications were provided by the workgroup to this updated definition and were followed by a new staged classification of AKI severity (Table 1). To summarize, the time constraint of 48 hours for diagnosis was selected based on evidence of adverse outcomes associated with small changes in creatinine when the creatinine elevation occurred within 24 to 48 hours  and to ensure that the process was acute and representative of events within a clinically relevant time period. In a landmark study conducted by Chertow and colleagues , the odds ratio for mortality with a change in creatinine of 0.3 mg/dl (25 μmol/l) was 4.1 (confidence interval 3.1 to 5.5), adjusting for chronic kidney disease. The time period of 48 hours was designed to eliminate situations in which the increase in serum creatinine by 0.3 mg/dl (25 μmol/l) is very slow and therefore is not 'acute'. The authors did not regard it necessary to wait 48 hours to diagnose AKI or to initiate appropriate treatment. Furthermore, the need to include urine output as a diagnostic criterion was based on knowledge that in critically ill patients this parameter often emerges as a sign of renal dysfunction before serum creatinine increases. It was recognized that a urine output reduction of less than 0.5 ml/kg per hour over 6 hours is not specific enough to lead one to diagnose AKI confidently, because hydration status, use of diuretics and obstruction can also influence urine volume; hence, the clinical context must be considered. Additionally, means to obtain accurate measurement of urine output may not be readily available in all cases, particularly in patients who are not admitted directly to the intensive care unit (ICU). Despite these limitations, it was felt that the evaluation of urine output might offer a sensitive way to identify AKI; its value as an independent criterion for diagnosing AKI remains to be established. Synopsis of RIFLE and AKIN criteria for AKI classification/staging. Small but significant changes can be identified between the two definitions. A time constraint of 48 hours for diagnosis (creatinine or urine output modifications) is required in AKIN criteria. GFR decreases for diagnosis are specified only by RIFLE. In both cases, only one criterion – creatinine or urine output – must be fulfilled to qualify for a class/stage. Classes L (loss of function) and E (end-stage kidney disease) of the RIFLE criteria are not reported. Given the wide variation in indications and timing of initiation of RRT, individuals who receive RRT are considered to have met the criteria for AKIN stage 3 irrespective of the stage they are in at the time of RRT. From Bellomo and coworkers  and Mehta and colleagues . AKI, acute kidney injury; AKIN, Acute Kidney Injury Network; GFR, glomerular filtration rate; RIFLE, Risk, Injury, Failure, Loss and End-stage kidney disease; RRT, renal replacement therapy. The goal of adopting these sets of explicit diagnostic criteria is to increase clinical awareness and diagnosis of AKI. Both RIFLE and AKIN criteria may cause an increase in false positives, such that some patients regarded as having AKI will not have the condition. Nonetheless, the decision to adopt less inclusive criteria should raise the index of suspicion for AKI, allow its earlier identification during the course of critical illness, and enhance opportunities to prevent or manage kidney damage. Recently, Barrantes and coworkers , in their retrospective study conducted in 120 patients who satisfied the AKIN criteria, showed that the mortality rate in this cohort of patients was significantly greater than that in patients who did not have AKI (45.8% versus 16.4%; P < 0.01). Interestingly, in multivariate logistic regression analyses, AKI was an independent predictor of mortality (adjusted odds ratio = 3.7, 95% confidence interval = 2.2 to 6.1) and it was a better predictor of in-hospital mortality than was Acute Physiology and Chronic Health Evaluation II score, advanced age, or presence of nonrenal organ failures. Median hospital stay was twice as long in patients with AKI (14 days versus 7 days; P < 0.01). Finally, the oliguria criterion of AKI included in the AKIN criteria did not affect the odds of in-hospital mortality. However, results of studies employing the AKIN criteria should be analyzed with caution. Several studies comparing the RIFLE and AKIN classifications were recently published and many others are currently under review. The largest of these is a retrospective reanalysis of the Australian and New Zealand Intensive Care Society database , which compared RIFLE versus AKIN during the first 24 hours after admission to the ICU. Estimates of prevalence and crude mortality were similar between the two classification schemes. The authors concluded that, compared with the RIFLE criteria, the AKIN criteria did not substantially improve the sensitivity, robustness and predictive ability of the definition and classification of AKI. However, this study looked only at the first ICU day, and therefore the 48-hour time frame required by AKIN was totally neglected. The design employed by that study was suboptimal in terms of comparing the two classifications, but new evidence regarding the clinical validity of the AKIN criteria (and compared with RIFLE) is expected in the coming year. AKI has been defined and detected by measuring surrogates of kidney function such as serum creatinine and urine output, but these markers are acknowledged as being insensitive and nonspecific for both acute changes to kidney function and kidney injury. They also increase late in the injury process. Consequently, they may not allow detection of an acute insult or potentially ongoing injury to the kidney. Alternative markers such as urinary analysis and novel biomarkers have been extensively examined and reviewed during the past 2 years. Two recent reviews [10, 11] recently concluded that the scientific basis for use of urinary biochemistry, indices and microscopy in patients with septic AKI is weak. More research is required to describe the accuracy, pattern and time course of these parameters in patients with septic AKI. Another review of 14 articles on the value of urinary biomarkers in the specific setting of septic AKI  showed that a promising future is apparently reserved for urinary biomarkers, although most of the reviewed studies were small, single-centre and included mixed populations of medical/surgical adult patients. Retrieved articles included data on low-molecular-weight proteins (β2-microglobulin, adenosine deaminase binding protein, α1-microglobulin, retinol binding protein, cystatin C and renal tubular epithelial antigen-1), enzymes (N-acetyl-β-glucosaminidase, alanine aminopeptidase, alkaline phosphatase, lactate dehydrogenase, α/π-glutathione-S-transferase, and γ-glutamyl trans-peptidase), cytokines (platelet-activating factor and IL-18) and other biomarkers (kidney injury molecule-1 and Na/H exchanger isoform-3). Increased levels of platelet-activating factor, IL-18 and Na/H exchanger isoform-3 were detected early in septic AKI and predicted kidney failure. Several additional biomarkers were evident early in AKI, but their diagnostic value in sepsis remains unknown. In one study, IL-18 excretion was greater in septic than in nonseptic AKI. IL-18 also predicted deterioration in kidney function, with increased values preceding clinically significant kidney failure by 24 to 48 hours. Detection of cystatin C, α1-microglobulin and IL-18 predicted need for renal replacement therapy (RRT). The authors concluded that that selected biomarkers may be promising in early detection of AKI in sepsis and may have value for predicting subsequent deterioration in kidney function. Neutrophil gelatinase-associated lipocalin (NGAL) is among the most upregulated genes in the kidney soon after ischaemic injury  and is easily detected in plasma and urine in animal models of ischaemic and nephrotoxic AKI . Expression of NGAL protein is also dramatically increased in kidney tubules of humans with ischaemic, septic, and post-transplant AKI . Importantly, NGAL in plasma was found to be an early predictive biomarker of AKI in a variety of acute clinical settings in pilot studies. In a cohort of 20 patients who developed AKI 2 to 3 days after cardiac surgery, plasma NGAL was elevated within 2 to 6 hours after cardiopulmonary bypass (CBP) . Preliminary results using the research-based assay also suggested that plasma NGAL measurements predict AKI after contrast administration . A recent prospective study was conducted to validate the Triage® NGAL test (Biosite, Inc., San Diego, CA, USA), a point-of-care, fluorescence-based immunoassay for the rapid quantitative measurement of NGAL concentration in EDTA-anticoagulated whole blood or plasma specimens . The study had the double aim of determining whether a rapid, standardized point-of-care NGAL assay correlated with the research-based assay. The second objective was to determine the utility of the point-of-care NGAL assay as a predictive biomarker of AKI after CPB in a large prospective paediatric cohort. During the cross-sectional analysis of 40 plasma samples (NGAL range 60 to 730 ng/ml) and 12 calibration standards (NGAL range 0 to 1,925 ng/ml), NGAL measurements by enzyme-linked immunosorbent assay and by Triage® NGAL test were highly correlated (r = 0.94). Then, 120 children undergoing CPB were enrolled in a subsequent prospective and uncontrolled cohort study . Plasma was collected at baseline and at frequent intervals for 24 hours after CPB and analyzed for NGAL using the Triage® NGAL test. The primary outcome was AKI, defined as a 50% or greater increase in serum creatinine. AKI developed in 45 patients (37%), but diagnosis using serum creatinine was delayed by 2 to 3 days after CPB. In contrast, mean plasma NGAL levels increased threefold within 2 hours of CPB, and remained significantly elevated for the duration of the study. By multivariate analysis, plasma NGAL at 2 hours after CPB was the most powerful independent predictor of AKI (P < 0.0001). For the 2-hour plasma NGAL measurement, the area under the curve (AUC) was 0.96, sensitivity was 0.84, and the specificity was 0.94 for prediction of AKI using a cut-off value of 150 ng/ml. The 2-hour postoperative plasma NGAL levels correlated strongly with change in creatinine (r = 0.46, P < 0.001), duration of AKI (r = 0.57, P < 0.001) and length of hospital stay (r = 0.44, P < 0.001). The 12-hour plasma NGAL strongly correlated with mortality (r = 0.48, P = 0.004) and all measures of morbidity mentioned above. The study is interesting and results are significant. The authors enrolled a large cohort of paediatric cardiac surgery patients, correctly utilizing the RIFLE criteria in order to achieve results that were comparable with current literature and similar trials. Nonetheless, it must be noted that paediatric postcardiosurgical AKI may have particular characteristics (starting from an AKI incidence of more than 30%) that require these results to be confirmed in a large adult cohort before the assay can be regarded to be definitively validated. Furthermore, additional prospective studies are needed to describe the diagnostic and prognostic values of NGAL accurately in septic AKI. Interestingly, in a cohort of 140 paediatric critically ill patients (aged between 1 month and 21 years who were mechanically ventilated and had a bladder catheter), Zappitelli and coworkers  correlated urinary NGAL values with AKI severity diagnosed with pRIFLE (a paediatric modified version of the RIFLE criteria described previously ). Thirty-four (24.3%) patients never sustained AKI and served as control patients. A total of 106 (75.7%) patients developed AKI. Mean and peak urinary NGAL concentrations increased with worsening pRIFLEmax status (P < 0.05). Urinary NGAL concentrations rose (at least sixfold higher than in control patients) in AKI, 2 days before and after a 50% or greater rise in serum creatinine, without change in control urinary NGAL. This marker performed as a good diagnostic marker for AKI development (AUC = 0.78) and persistent AKI for 48 hours or longer (AUC = 0.79). Urinary NGAL exhibited a worse performance in terms of diagnosing AKI, when it was measured after a rise in serum creatinine had occurred (AUC = 0.63). Furthermore, despite the known association between NGAL and inflammation , an association between pRIFLEmax and increasing urinary NGAL concentrations in patients with sepsis and in those without sepsis was observed. Urinary NGAL can be considered an early AKI marker in a heterogeneous group of critically ill paediatric patients with unknown timing of kidney injury. If the promising value of novel urinary and serum biomarkers is confirmed by large-scale studies conducted in different populations of critically ill patients, then it might be expected that these molecules will be utilized as an alternative to creatinine for AKI definition, diagnosis, prognosis and therapeutic timing . An Australian survey of data of all adult admissions to 20 Australian ICUs for 24 hours or more from 1 January 1996 to 31 December 2005 was conducted to assess trends in incidence and mortality for ICU admissions associated with early AKI . The authors analyzed 91,254 patient admissions, including 4,754 cases of AKI, for an estimated crude cumulative incidence of 5.2%. The incidence of AKI increased during the study period, with an estimated annual increment of 2.8%. The crude hospital mortality was significantly higher in patients with AKI than in those without it (42.7% versus 13.4%). There was also a decrease in AKI crude mortality (annual percentage change: -3.4%), however, which was not observed in patients without AKI. After covariate adjustment, AKI remained associated with a higher mortality (odds ratio = 1.23; P < 0.001), but there was a declining trend in the odds ratio for hospital mortality. Such retrospective studies and many other observational ones suggest that critically ill patients with AKI are increasingly older, have more co-morbid disease, have a higher incidence of sepsis, and have greater severity of illness and organ failure . It is possible, however, that outcomes in patients treated about 10 years ago is not meaningful when compared with prospective data from multinational and multicentre assessment of patients who are all critically ill, treated in an ICU, and typically receiving mechanical ventilation and vasopressor therapy . Despite the much greater severity of illness in patients treated today, the mortality of AKI has not increased and has perhaps slightly decreased, the duration of treatment has clearly decreased in terms of need for dialysis; also, the time spent in the ICU and in hospital, and artificial renal support techniques have also changed markedly (significant findings have been reported for the subgroup of AKI patients who have suffered trauma ). It is likely, hence, that the 50% to 60% crude mortality associated with AKI will not change dramatically in the coming years, because as therapeutic (and diagnostic) capabilities improve, the health care system will admit and treat progressively sicker patients with AKI. Comparisons that do not take into account this continuing adjustment and that do not appreciate the continuing change in illness severity will present a misleading picture of achievements associated with improvements in technology and medications. Heparin-induced thrombocytopenia (HIT) is caused by a heparin-induced antibody that binds to the heparin-PF-4 complex on the platelet surface. In patients receiving heparin continuous infusion, this may or may not lead to platelet activation and consumption, thrombocytopenia, and both arterial and venous thrombosis . Depending on the dose and type of heparin, the population and the criteria used, 1% to 5% of treated patients develop HIT. Platelet count typically decreases rapidly by more than 50% after approximately 1 week or earlier after use of heparin. Diagnosis depends on a combination of clinical and laboratory results. Reliable diagnosis is complicated by the fact that the incidence of false-positive enzyme-linked immunosorbent assay findings is high. Unfortunately, the more precise carbon 14-serotonin release assay is not routinely available . While awaiting a final diagnosis, all forms of heparin should be discontinued and an alternative anticoagulant administered. There are no randomized controlled trials to show which anticoagulant is best for HIT. The choice depends on local availability and monitoring experience. Inhibition of thrombin generation can be achieved via direct inhibition of factor IIa (r-hirudin, argatroban, or dermatan sulphate), factor Xa (danaparoid or fondaparinux), or both (nafamostat) . In a recent study, the pharmacokinetics and pharmacodynamics of danaparoid during continuous venovenous haemofiltration (CVVH) were examined in patients with suspected HIT . During CVVH, danaparoid can be removed only by means of a polyarylethersulphone membrane, with a sieving coefficient of 0.78 ± 0.03 . Therefore, treatment with a continuous infusion of danaparoid may carry a risk for accumulation in patients with AKI who are dependent on CVVH. Using the recommended dosing scheme, patients may experience bleeding, especially when peak anti-Xa levels exceed 1.0 anti-Xa U/ml. Therefore, a safer dosing scheme for danaparoid was tested, based on a mathematical model aiming to achieve a peak anti-Xa level of less than 1.0 and a maintenance level of between 0.5 and 0.7 anti-Xa U/ml. This dosing scheme was prospectively tested in the first CVVH run in a cohort of five patients with suspected HIT. CVVH with a blood flow rate of 150 ml/minute and a substitution rate of 2,000 ml/hour was performed using a cellulose triacetate membrane. Based on the mathematical model, danaparoid was administered as a continuous infusion of 100 anti-Xa U/hour after a loading dose of 3,500 anti-Xa U. Serial measurements of anti-Xa activity and prothrombin fragment F1+2 were performed at baseline; at 5, 15 and 30 minutes; and at 1, 2, 4, 8, 16 and 24 hours after the danaparoid loading dose. The median anti-Xa activity reached a maximum of 1.02 (0.66 to 1.31) anti-Xa U/ml after 15 minutes and gradually declined to 0.40 (0.15 to 0.58) anti-Xa U/ml over 24 hours. Target anti-Xa levels were reached 2 to 12 hours after the loading dose. Median prothrombin fragment F1+2 gradually decreased from 432 (200 to 768) to 262 (248 to 317) pmol/l after 24 hours. A more than adequate median circuit survival time of 50.2 (20 to 89) hours was achieved. No bleeding or thromboembolic events occurred throughout the described treatment period. These interesting results require confirmation in a clinical trial using standard heparin as control anticoagulation aiming to evaluate the efficacy and safety of danaparoid 'low-dose' infusion. Unger and colleagues  conducted an original experimental study to verify a strategy of blood flow rate optimization in a extracorporeal circuit via common duallumen catheters. The authors treated 34 ventilated supine pigs with CVVH using traditional axial duallumen catheter (11-Fr, 20 cm long, side holes) placed in the femoral vein (19 animals) or duallumen catheter plus an 8.5-Fr sheath (15 animals), after determination of the highest values for access flow (Qa). High Qa rates (>300 ml/minute) were allocated to the duallumen catheter group; low Qa rates were switched to a 'dual-vein' approach, placing a second catheter (8.5-Fr sheath) for separate blood delivery. The authors aimed to demonstrate whether hypovolaemia, pathological haemorheology (obtained with blood substitution by normal saline, different 6% hydroxyethyl starches, human albumin or gelatin polysuccinate) and/or low cardiac output reduced available blood flow rates with the two approaches. Haemodynamics (cardiac output and central venous pressure) and blood composition (blood cell counts, plasma proteins and colloid osmotic pressure) were measured. Catheter tip positions and vessel diameters were studied using computed tomography. Interestingly, neither haemorheologically relevant aspects nor cardiac output and central venous pressure correlated with the achievable Qa via the femoral vein access. Even though the catheter tip of the alternative catheter provided common iliac vein but not caval vein access, this catheter type allowed greater Qa than the duallumen catheter positioned in the caval vein. None of the evaluated reasons for limited Qa via the arterial line of an axial duallumen catheter could be confirmed. The 8.5-Fr sheath performed quite well as an alternative catheter, and the authors believe that clinical studies to re-evaluate the dual-vein approach, with separate blood delivery via a tip-hole catheter in order to provide high-volume haemofiltration, are justified. Similarly, Di Carlo and coworkers  proposed use of an analogous approach in paediatric critically ill patients undergoing continuous RRT. In order to establish non-obstructive access for haemofiltration in a newborn, whose femoral vein is about 4.5 mm diameter and is unlikely to accommodate a 7-Fr catheter without near-total occlusion and subsequent stasis, two single-lumen thin-walled vascular 'introducer' sheaths can be used in two separate veins. During insertion over a guidewire, the thin wall of the sheath is supported by a removable tapered dilator. A haemostasis valve is in position immediately above the proximal entry point to the sheath, and must be fully secured with an obturator to prevent air embolus. Animal data suggest that polyurethane catheters are less likely than silastic to encourage the growth of bacteria in the presence of a fibrin sheath. The traditional sheath is composed of Teflon, however, which is stiffer than polyurethane. New generation sheaths will be released that are composed of a polyurethane blend with improved kink resistance. Another innovation might be a method for integrating wound-wire reinforcement within the wall of the catheter. It will be interesting to observe how these new approaches may be used to manage the issues of circuit patency and adequate blood flow rate during continuous RRT, which are generally left to operator experience and nurse expertise. Increased awareness of the importance of CRRT session length and downtime is progressively leading to more detailed research into the field of anticoagulation and vascular access. However, in routine clinical practice (especially in the paediatric setting), continuous treatments with low-dose or no heparin and double-lumen catheters requiring a single venipuncture are still 'gold standards' and (thus far) represent the safest and simplest strategy. In conclusion, the reported manuscripts showed how RIFLE criteria were widely accepted by scientific community, whereas AKIN criteria are still under validation. NGAL assay and other biomarkers for early AKI diagnosis, when certified for routine use in clinical practice, will certainly be a major progress for prevention and therapy of AKI, and we will might assist to a significant improvement in AKI outcome in the next 10 years. Finally, if original and safe anticoagulation strategies are important for CRRT circuit patency, optimization of vascular access is definitely one of the most important targets in order to increase filter lifespan: new original studies on these fields are strongly needed.